Just a reminder that on Sunday 28 April, Team Healthy Minds will be collectively running 26 miles (on a treadmill at the piece hall) in support of Jilly, who at the same time will be running the London marathon, for Healthy Minds. 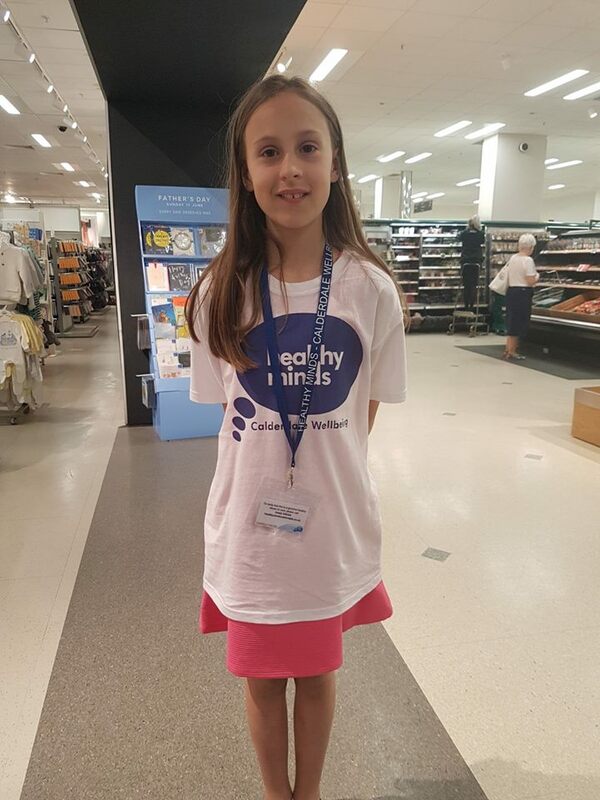 This young lady is just one of the kind volunteers, who is generously giving up some of her time to help to reach the target on the treadmill. If you would like to help with part of the 26 mile run, feel free to join them at The Wellbeing Festival – taking place at The Piece Hall, they will be there 10:00am-4:30pm. They are hoping to raise £260 for their efforts, that’s just £10 per mile! Please support this worthy cause by donating what you can by visiting the Facebook page! 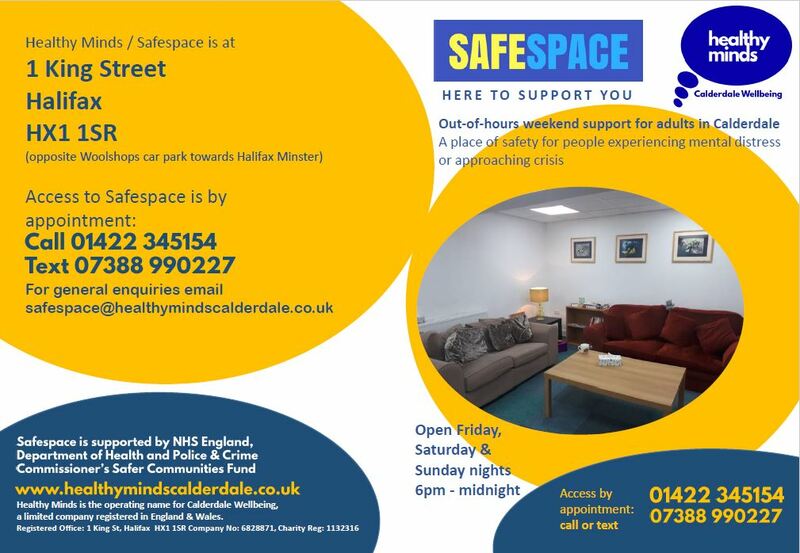 Don’t forget Safespace the Out-of-hours weekend support for adults in Calderdale is open Friday, Saturday & Sunday every week from 6:00pm until late. 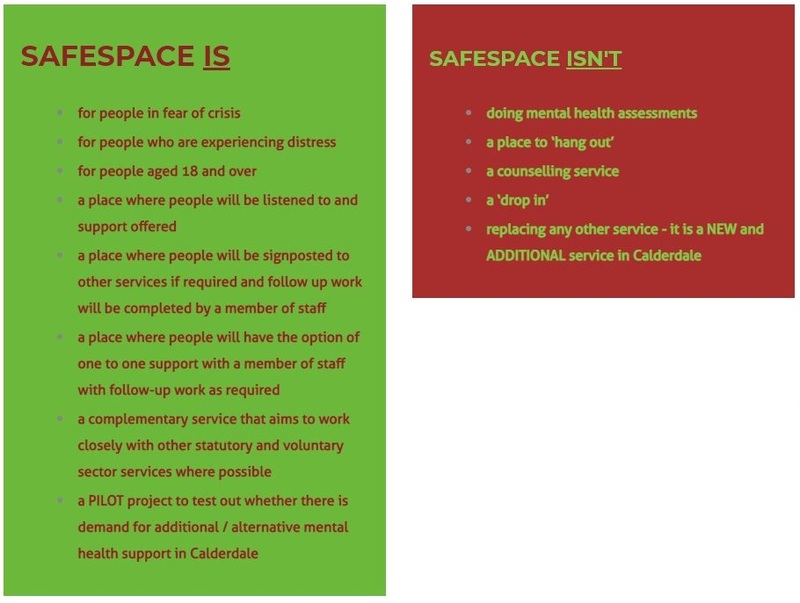 Safespace is a place of safety for people experiencing mental distress or approaching crisis. Access to the town centre premises is by appointment only. You can contact Safespace via Facebook on 01422 345154 or text 07388 990227. Lines open at 6:00pm and the last appointment time is 11:00pm. The team will take some basic details from you and offer one or more options of either a Face-to-Face appointment an offer of group support or support over the phone. Upon arrival you will be greeted at the door and a worker will be ready to start your appointment, you will have the opportunity to talk about what’s happening for you and agree the next steps. In the group area you can engage in various activities and interact with others if you wish. Depending on capacity you may be able to access more than one type of support. Safespace is now also open Monday & Wednesday evenings (telephone support only) 5:00pm-10:00pm. Safespace is run by workers and volunteers who all have personal experience of emotional distress. 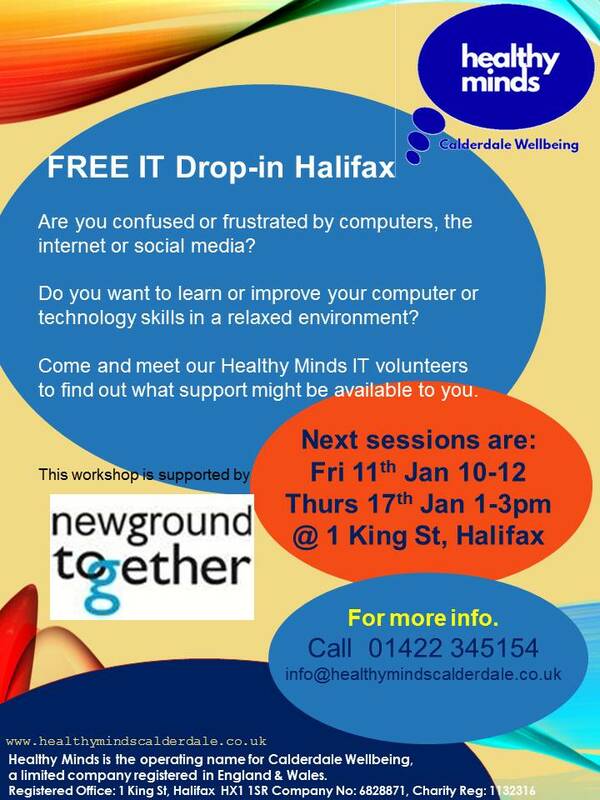 Healthy Minds Calderdale is seeking a new trustee to join its Board, who will take on the role of Chair of the Board as the current Chair is stepping down after a number of years. 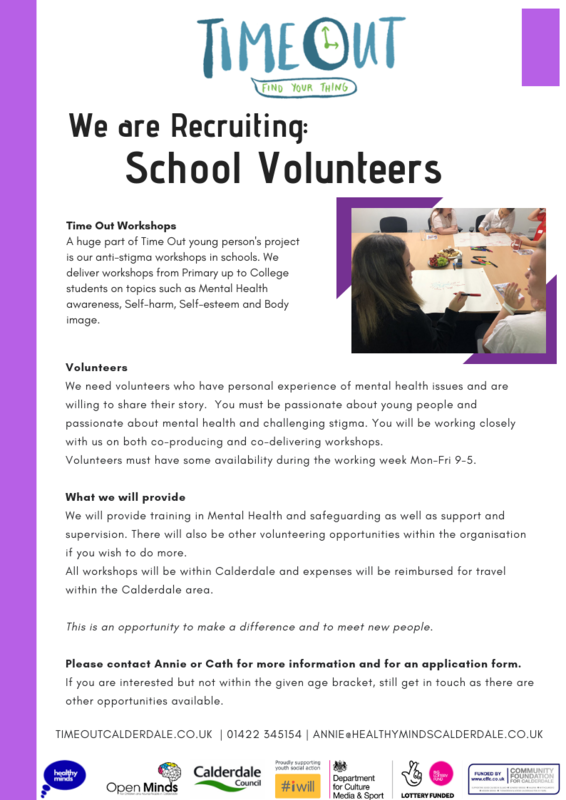 Applicants will need to have a commitment to furthering the aims of the organisation, experience of committee work, a knowledge of mental health and some awareness of the voluntary sector in Calderdale. You will receive training and induction, and the support of the outgoing Chair, the Board of Trustees, and the Chief Officer. This is an exciting and rewarding opportunity to work with a successful and respected charity and to help them move forward into the next decade. The time commitment is flexibly 8 hours a month, mainly in 2 hour blocks, and meetings take place evenings and daytimes. They are based at King St in central Halifax. Closing date for applications is Monday 18 February. 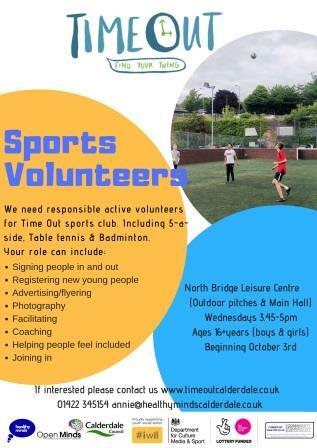 Please email Jen Fagan for an application pack and more information: faganjenny@aol.com or ring for an informal discussion on 07795035567 / office 01422 345154. 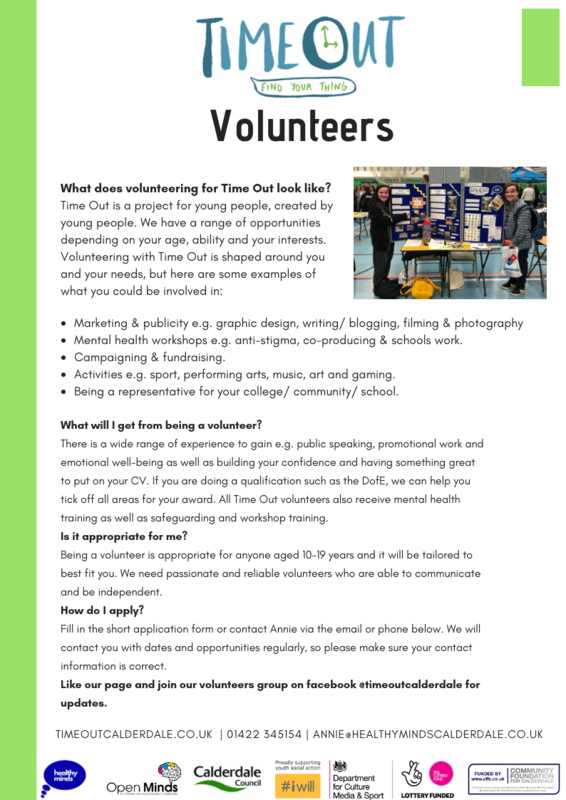 Calderdale Youth Council and the Tough Times Reference Group have devised a survey on Mental Health and Emotional Wellbeing to gather information about the experience of mental health and emotional wellbeing for children and young people aged 5 – 19 (up to 25 for those with learning difficulties or disability) in Calderdale. The information we gather will be shared with Commissioners and Service Providers so we can influence services to make positive changes that will help children and young people in Calderdale. 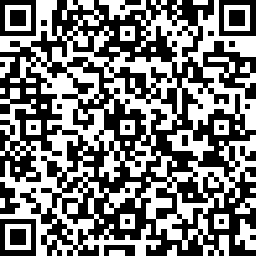 The survey will close at 5:00pm on Friday 15 February.